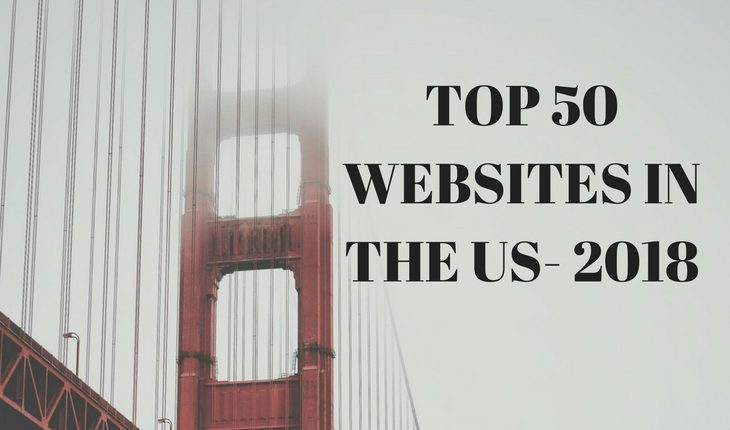 The below list”Top websites in USA” is based on several factors like the daily time spent by a visitor on the site, average monthly visitors etc. The list is representative of the behavior of net surfers in the US. The list can vary based on the preferences of the visitor and thus can alter even on a daily basis, though not on a big scale. Top websites in USA 2018. Google.com– The Search Engine everyone used by millions of users across the world. Youtube.com– The video streaming platform. Reddit.com– It contains user generated news links. Amazon.com– Founded by Jeff Bezos, Amazon is the preferred shopping destination for many. Wikipedia.org– A place where one can learn about virtually any topic. Yahoo.com– Search and content distribution website. Twitter.com– The short text posting website. Netflix.com– Website providing awesome video content. Ebay.com– Mostly used for auctioning and reselling. Linkedin.com– The website for professional connections. Imgur.com– A story telling community that uses images. Craigslist.org– You can literally find anything you want on Craigslist. Diply.com– Content distribution platform that entertains everyone. Microsoftonline.com– The domain name tells it all. Live.com– A search engine from microsoft. T.co– Twitter uses the t.co domain as part of a service to protect users from harmful activity, to provide value for the developer ecosystem, and as a quality signal for surfacing relevant, interesting Tweets. Tumblr.com– Free blog hosting service. Imdb.com– Online Movie database where users can rate movies. Bing.com– Search engine by Microsoft. Chase.com– Website of the largest banking company in the US. Pinterest.com– An online pinboard where you can put the collection of things you like. Nytimes.com– Website of a leading US daily. Paypal.com– Payment processing platform where a user can make payment to someone using his/her email id. Microsoft.com– Website of software giant microsoft. Apple.com– Website of software and tech devices manufacturer. Github.com– One can share code with colleagues here. Yelp.com– A platform for rating and reviewing places. Wellsfargo.com– One can get top financial services here. Bankofamerica.com– Website of a leading bank in the US. Hulu.com– For streaming television shows. Intuit.com– Provides tax compliance products for tax professionals. Salesforce.com– Provides Customer Relationship Management(CRM) software. Walmart.com– Products from Walmart inventory can be brought here. Blogspot.com– A free blogging platform. Stackoverflow.com– You can find solution for most of the things here. From programming languages to english, you have it all here. Washingtonpost.com– Online publication of a leading US daily. Dropbox.com– File storing and sharing platform. Zillow.com– Online property search platform. etsy.com– Online clothing and accessories store.